It's a bold prediction, but it's very possible that the new Vego Spread will be one of the bestselling products ever seen not only in our store, but in most natural supermarkets in Australia. Why? It's the ethical version of Nutella and we know how (and why) people love the taste of Nutella. Nutella has sustainable palm oil in it. We allow sustainable palm oil in our store, but we also know many people don't like it. Vego is palm oil free. Nutella has dairy in it and we have a lot of vegan customers. Vego is vegan. Nutella has a synthetic vanilla in it. Most of our customers would have this on their no list. Vego uses natural vanilla. Nutella is packed in plastic. Vego is packed in glass. If you love Nutella, please, don't let us discourage you from purchasing it. We have had a lot of request for a more ethical choice. Vego is NOT a health food. It has a LOT of sugar in it, like Nutella. We are under no illusion that this is exactly what it is, a sweet, sugary, chocolatey and nutty piece of crunchy heaven on a spoon. Does Vego Spread taste like Nutella? From the very first day we posted about the Vego Spread, this was the question we got asked. I knew what Nutella tasted like, I knew what the Vego Bar tasted like so I was fairly certain I knew the answer. Today we confirmed it. Below, we will explain the taste and texture differences between Vego Spread, Nutella and a healthier option, the Hazelnut Chocolate Spread from Loving Earth. When we talk about richness, we're referring to how chocolatey it is - your ability to sit there watching Bridget Jones's Diary and eating it by the spoonful!!! They're close, but the Vego is a little more rich, and visually, it's darker. The Loving Earth is quite rich too, but it doesn't have that sugary overtone on top. 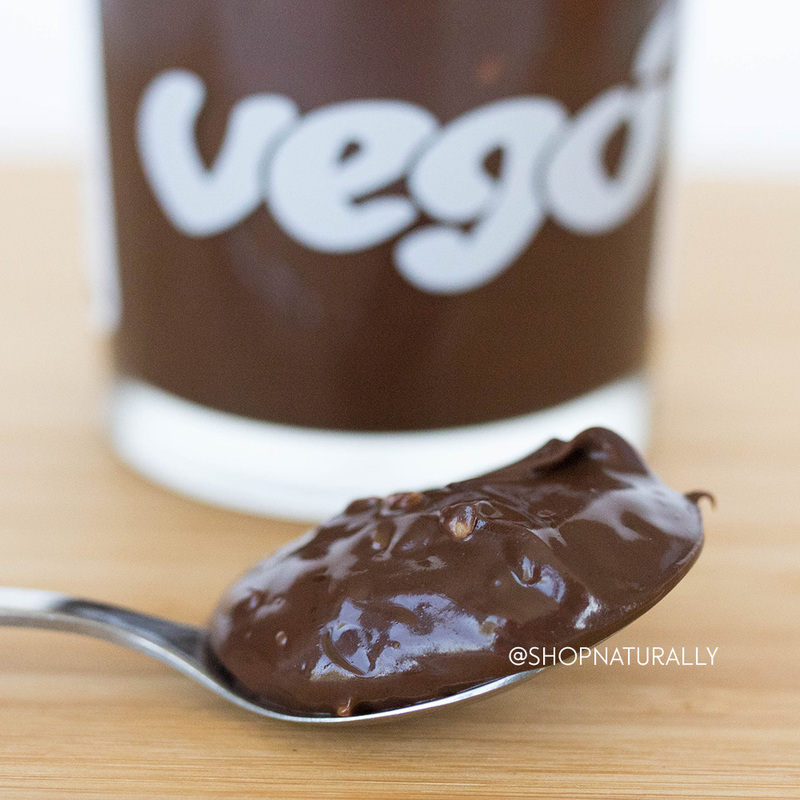 If eating by the spoonful, you'll want to eat a little less Vego than Nutella, but this is probably a good thing. Nutella has this velvety smoothness that just isn't going to be beaten in this space. Vego Spread comes really close but it has crunchy bits of nut in it. Honestly, unless your 'thing' is to let your tongue smear it all over the roof of your mouth and you really want that smoothness, this really isn't a thing one way or the other. But in the interests of being thorough, we thought we'd fill you in. When it comes to the Loving Earth, it's smooth, but a little on the earthy / gritty site rather than velvety soft. There's not a lot in this either. Nutella is a little thinner, as you can see by the photograph above, the Vego Spread will sit very nicely in a spoon without starting to run off. The Loving Earth is a little thicker again. All three are simple enough to spoon out of the jar. Out of the fridge, the Loving Earth will be a little thicker because of the coconut oil going solid. It will have a tendency to split in hotter weather too. If it does, warm it up and mix it back together. We don't see this splitting issue to be a problem with the Vego when we look at the ingredients. Make no mistake, the Vego Spread and Nutella have a lot of sugar in them. They're a sweet chocolate spread. The Loving Earth is done with coocnut nectar, but once your digestive system gets a hold of it, sugar is sugar. Low GI will release slower. The other two are cane sugar. Vego uses Raw Sugar. Nutella just says sugar. I really don't think it makes any difference whether it's raw or not. Using Nutella as the base flavour here, Vego has the same sweetness, almost as smooth but with crunchy pieces in it. They're small and easy to eat. Vego is just a little richer and darker in cacao flavour but not too much. The two are quite similar in flavour profile. The Loving Earth is very different. There's a coconut flavour that carries over the top of the chocolate and nut, so much so that I think it should be in the name. It's delicious, but nowhere near as sweet and a little coarser in texture.